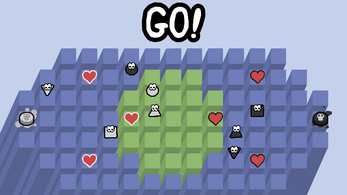 Heart Hop is an eight player, team based, battle game played with four controllers. There are two teams, light and dark. Each team either needs to step on all their enemy's hearts or on the button at the back of their base. 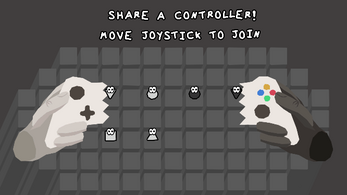 Players share a controller with their opponent with each player holding one side of it. 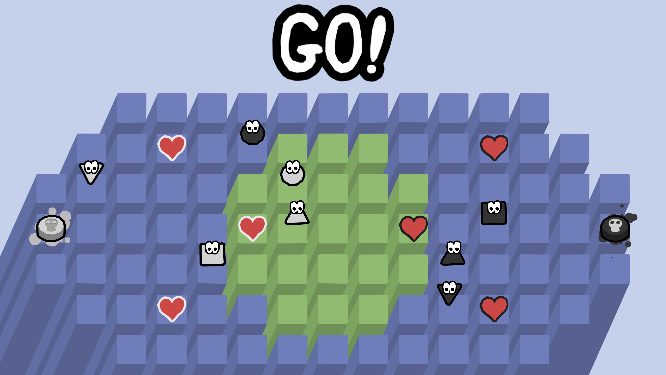 The game has a continuous 2 second countdown and when it says "go!" each player moves in the direction they're holding. If two players land on the same spot they bounce back to their original space. This allows for some team members to stay back and block their opponents from hitting their hearts. This game should be played with four controllers, but if you don't have them you can press "Space" during the tutorials to skip past the set-up.